Every year 21st March is celebrated as World Forest Day, to spread awareness about the importance & value of forests and trees among the communities. On this occasion, Mukti organised an awareness procession against the rising Global Warming threat, through Right to Information (RTI) project, for three consecutive days starting from 22.3.2019 to 24.3.2019. 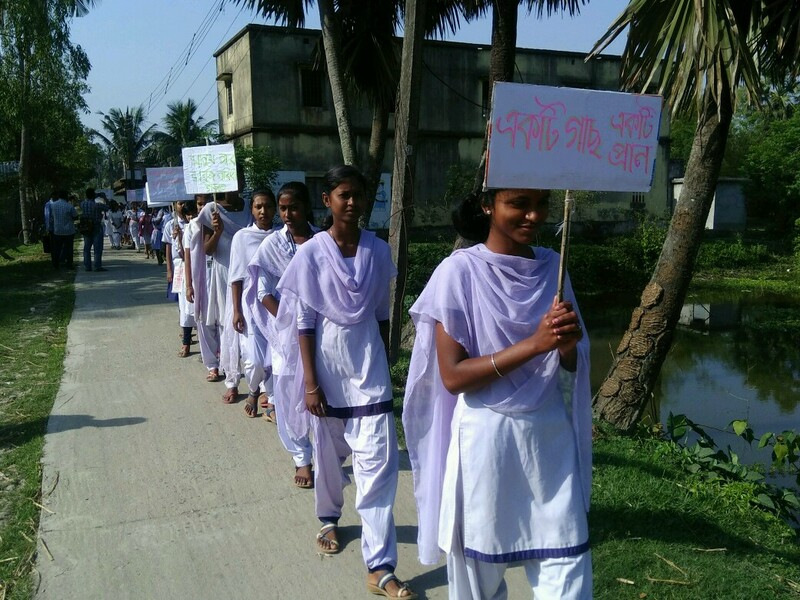 The three days procession was held on three different places – Nagendrapur GP Mathurapur Block No 2, Kankandighi GP Mathurapur Block No 2 and Sonatikari. Approximately 340, 320 and 160 people took part on each of the days respectively. Students from Mukti Support School, women from Mukti Community Development Fund (MCDF), and farmers from the Sustainable Agricultural Movement (SAM) took part in the procession. The walk started at 7 am to 10 am for about 4 to 5 kms each day, the participants holding banners with the slogans “Pran bachate sundarban parabhumite badabon”, “We will make the world GREEN, though we are not green”, “Lets grow trees to save the surroundings”, “Let us vow to create pollution-free society”, “Grow trees & save lives”, “Let us take an oath not to cut trees and bring danger”, “One tree, one life” etc. Snacks were provided to every participant at the end of the program. It was a great delight and satisfaction for Mukti to make the people feel for their society and we expect that in the future they will involve themselves in sustainable activities like growing trees and makes the surroundings GREEN.